Johnny Perez had been out of prison for nine months when he sat in an overly air-conditioned room for nearly seven hours to talk about his experiences in solitary confinement. Johnny Perez had been out of prison for nine months when he sat in an overly air-conditioned room for nearly seven hours to talk about his experiences in solitary confinement. He was one of the last people to testify at an all-day briefing about the solitary confinement of juveniles held by the New York State Advisory Committee to the U.S. Commission on Civil Rights. The panelists before him included Anthony J. Annucci, the commissioner of the New York State Department of Corrections and Community Supervision, New York City councilmember Daniel Dromm, former judges, attorneys, advocates and even a librarian who worked with teens in a Nassau County jail. They testified about the conditions of solitary, known as “the bing” at Rikers, with people of all ages being held for 23 or 24 hours a day in their cell with no human contact. Food is slid through slots in the door to each cell. The one hour of recreation time allotted each day is usually held at 4 a.m. and is spent in a chain-link cage. Most don’t bother to go. And some may not even be given the opportunity to decline. Johnny Perez later spoke with me in more detail about spending 60 days in the bing at age 16. “I don’t remember going to rec — or even being asked to go to rec,” he told me. But solitary confinement wasn’t the only horror that advocates have condemned. Bryanne Hamill, a retired family court judge and current member of the New York City Board of Correction, which monitors conditions in city’s jails, noted that mental health services are not available to people in general population, which are those who are not restricted to solitary confinement or to the mental health unit. The U.S. Attorney found that approximately 51 percent of adolescents at Rikers were diagnosed with some form of mental illness. Those who demonstrate a dire need for mental health services are placed in the mental health observation unit or the restrictive housing unit. Furthermore, Hamill noted, Rikers currently has no adolescent psychiatrist. Teenagers with mental illnesses are more likely to not follow rules or engage in behavior that leads to solitary confinement. According to Hamill, approximately 60 percent of adolescents in the bing have mental health diagnoses, in contrast to 40 percent of the adults. Investigators found what they called “alarming rates of force used by staff,” including “headshots” — or blows to a persons’ head or face. Between 2011 and 2012, jail staff used physical force approximately 1,200 times against boys ages 16 to 18. These 1,200 times included many times when force was used as a response to a teenager arguing with staff or as punishment or retaliation. The 79 pages detail a litany of horrors faced by teenage boys at Rikers Island. And it’s important to keep in mind that most of them have been arrested and are held awaiting trial. They have not been convicted. Any person aged 16 or over in New York state is automatically charged as an adult. 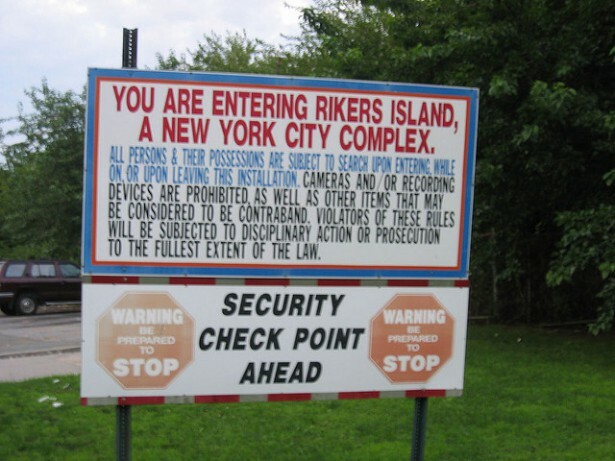 If that person is unable to afford bail, he or she is sent to Rikers Island until the case is resolved. Most teenage boys are placed in the Robert N. Davorens Center, known as C-74. Teen girls are housed at the Rose M. Singer unit, which is the only building for women of all ages on the island. The average length of incarceration for teens at Rikers is 74.6 days. Attorney General Eric Holder has called the high rates of violence and solitary confinement “inappropriate and unacceptable” and has vowed that the Department of Justice will “work with the City of New York to make good on our commitment to reform practices that are unfair and unjust.” The U.S. Attorney recommended that all adolescents be removed from Rikers Island. But without constant attention, pressure and organizing by advocates, including formerly incarcerated people, teens will probably continue to be housed at Rikers Island while awaiting trial and under the same conditions that both the U.S. Attorney and advocates have condemned. The unlikely alliance of former judges, elected officials, advocates, attorneys and formerly incarcerated people who testified at the State Advisory Committee hearing have been pushing for deep-rooted changes at Rikers. Others, however, remain resistant. Norman Seabrook, president of the union of New York City correctional officers, had been scheduled to testify at the briefing. He did not appear. However, in an interview with the Center for Investigative Reporting, he defended using solitary confinement as punishment as well as the use of force. “Sometimes you have to use force,” he said. “And when you use force, I instruct my officers, use whatever force is necessary to terminate that threat.” The U.S. Attorney criticized that use of force as “excessive and unnecessary.” Seabrook also stated that the union fought for the use of punitive segregation for those who broke the rules.